1 x LED Cooling Fan 1 x 120mm Radiator 1 x 140mm Reservoir 1 x 12v Pump 1 x 12v Blue LED Thermometer 1 x Clear Flow Meter 1 x 3 LED Lights 1 x Universal Clear GPU Block 1 x Universal CPU Block 1 x Back Plate for CPU 1 x Thermal Paste Pad 1 x 3m PVC Tubing 10 x Copper Painted Compression Fittings 1 x Metal Fan Grill Mounting Screws. 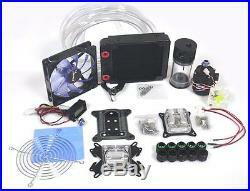 Brand Glowry Type Complete Kit MPN 120 PC Water Liquid Cooling Complete Kit System EAN 0714046801971. 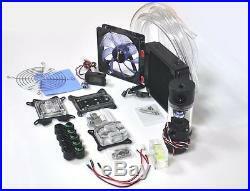 COMPUTER WATER COOLING KIT 120mm RADIATOR 140mm RESERVOIR PUMP CPU GPU BLOCKS FLOW METER LED THERMOMETER PVC TUBING. Your satisfaction is our top priority. We Don't beleive in laying down a series of rules, telling our customers what they should and should not do. We only ask that the customer covers the cost of returning the goods. Thank you very much for your understanding. If you placed the order by mistake, please inform us, which is totally ok for us to cancel the order for you. 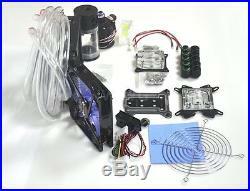 120 PC Water Liquid Cooling Complete Kit System. 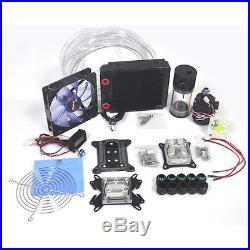 The item "COMPUTER WATER COOLING KIT 120mm RADIATOR 140mm RESERVOIR PUMP CPU GPU BLOCK NEW" is in sale since Wednesday, June 15, 2016. This item is in the category "Computers/Tablets & Networking\Computer Components & Parts\Fans, Heatsinks & Cooling\Water Cooling".